Pumpkins grow in spite of my lack of attention. Last year, after my husband Keith’s passing, I made a few efforts to try and create normalcy, or at the very least offer the pretense of bringing it about. I bought a pumpkin and put it out by the front door. I bought some colorful gourds and put them in a bowl on my dining room table. And I tried to keep up with all the vegetables that were still coming in from the crop share I’d joined earlier in the year. But as Autumn brought the chilled promise of winter, and the leaves began to change and pile up outside my door, the fact that I was facing the season alone became palpable. The pumpkin out front began to rot in place at the corner of the front garden, and I tossed a couple of the gourds into a hole Lenny had dug outside my backdoor when they began to mold. When a small baking pumpkin began to rot before I could cook it, I couldn’t be bothered taking it out to the trash in the cold dark winter. 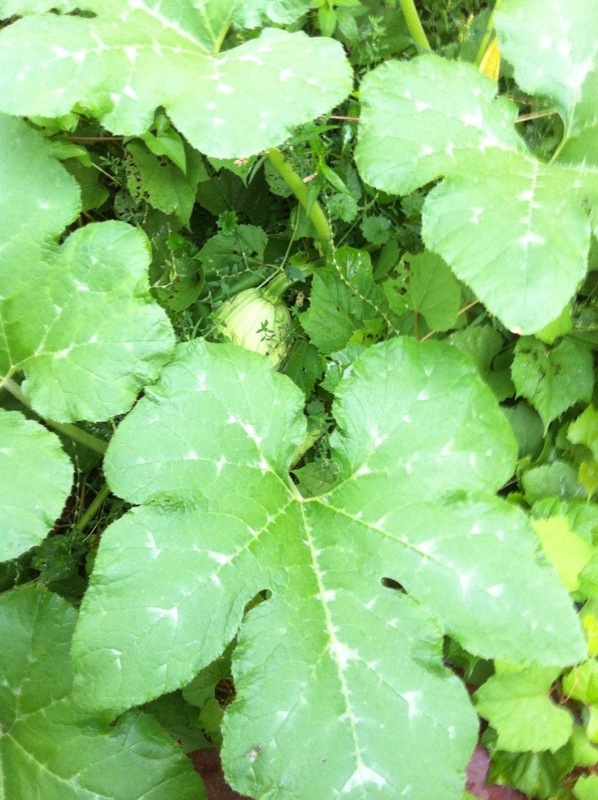 Instead, it joined the gourds in the hole out back. Imagine my delight when Spring came and seedlings began to sprout. Little had I known that these would become magic seeds. Like a horizontal version of Jack in the Beanstalk, the plants began to grow – out in the front garden, and even more out my back door. It took months before any fruit began to show on the plant out front, while the backyard began to look like a scene from Jurassic Park as the plants multiplied, sprouted fruit, and crept quickly across my patio and over my fence gate. It quickly became clear that it was more than one kind of plant. 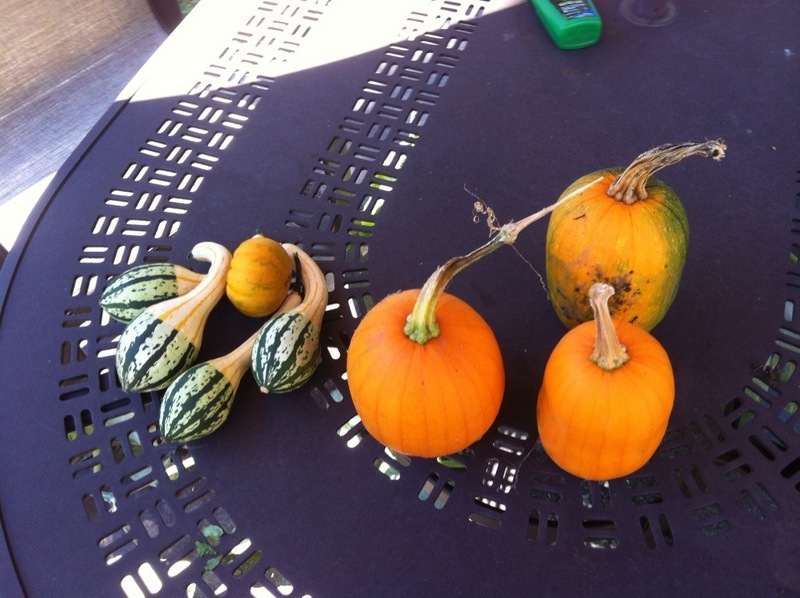 Lo and behold, several kinds of gourds became apparent, and two shapes of small pumpkins. 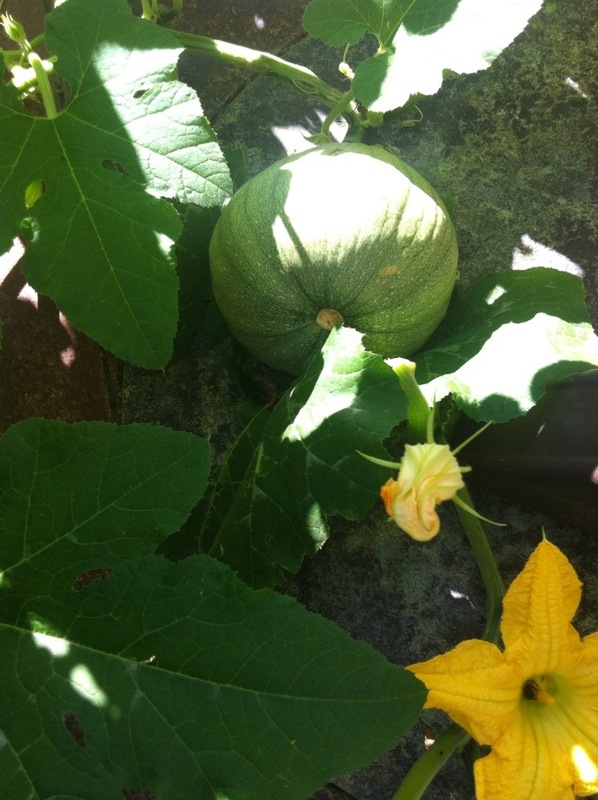 The kids began to pay attention, teasing me on my gardening approach, and claiming their own pumpkin from the patch. The whole situation was rather amusing, even as we would gently move the giant plants tendrils back and forth when mowing the lawn or trying to weed the overgrowth of morning glories tried to take over. But apparently my utility company was less than amused, especially when access to the meter became nearly impossible. A letter came in the mail indicating they had estimated my bill rather than do an actual reading due to lack of access from “overgrown weeds” around the meter. More abundance makes its way to my Jurassic Park garden. I kept the letter out so I could see it when I walked through the living room, shaking my head in amusement. But finally I relented and decided to take my cutters to the mass of weeds that had overtaken the fence gate, even the pumpkins. Then I took on the overgrown bushes around the airconditioning unit. In between, I took a break. But not to rest, but to refocus. Inside the house was a similar tangle of overgrown brush, but in the form of files and papers. These created a palpable weight upon my heart and mind. They needed filing, put away. As I moved through this pile, I expanded my reach and took on files of Keith’s old business, then moved on to his final papers, the will, his death certificate, and finally adding to the pile… his birth certificate. There it was… all neatly put away in a file box ready for storage. I breathed a deep long sigh. Life in a box. Well, not really. But it seemed that way… full circle… life… death… birth. Inside, as the piles inside were cleared away, I began to see space in the room, in my file cabinets, on the floor and the weight of their presence, and their meaning began to fade. Outside, as the piles of debris were packed into the yardwaste bags and dragged to the curb, the sun began to shine through the leaves and branches to reach the cool mossy ground. I was tired and sore, but it was the kind of feeling that came from a day of hard work and accomplishments. Life goes on. You just have to make room and be open to letting it happen.